Did not know where exactly to put this post however as South America is the nearest country to Antarctica, it's here. I have been recently very interested in learning about dinosaurs from this area over most others and here's some info on the Antarctica. Imagine how it would be like to explore the coldest place on Earth and the challenges that one may face when trying to identify material from this location. A fully fleshed-out Cryolophosaurus is on display at the Natural History Museum LA. Photo by Charly Shelton. Antarctica was not always a frozen wasteland. Back in the Late Permian and Early Triassic, about 260 million years ago, it was more like Seattle, Washington in terms of climate – wet and full of giant forests, with temperatures in the 50s-to-60s degrees Fahrenheit. This was still slightly colder than the rest of Pangaea, but warmer than today’s Antarctic climate average of 20 degree summers and -56 degree winters. Suffice it to say, it was a great place for amphibians and, later into the Mesozoic era, a home for dinosaurs. By the Early Jurassic, around 190 million years ago, the land that would become Antarctica was home to a very unique, and fancy, dinosaur. “Antarctic Dinosaurs” is a new exhibit recently opened at the Natural History Museum of Los Angeles County and features the story of Antarctica, both as a landmass through time and as the antagonist in the story of how a crew of palaeontologists from NHMLA and the Field Museum in Chicago had to battle the elements to get into the interior of the continent and extract the fossils from a hillside in Gordon Valley. Along the way, guests learn of the many expeditions that came before – some successful and some ill-fated – to study the interior of the continent and find the fossils. Taniwhasaurus antarcticus has been found in Antarctica, New Zealand and Japan. The star of the attraction is the 25-foot-long carnivore, Cryolophosaurus. This is a unique dinosaur with a very fancy little bone crest atop its head in the shape of a quaff, earning it the nickname “Elvisaurus.” Both a full-sized skeletal reconstruction and a full-sized fleshed-out model are on display in the exhibit to allow guests the opportunity to really get to know the dinosaur on a life-size basis. Alongside the large carnivore are two smaller dinosaurs found on the same hillside – Sauropodomorphs A and B. 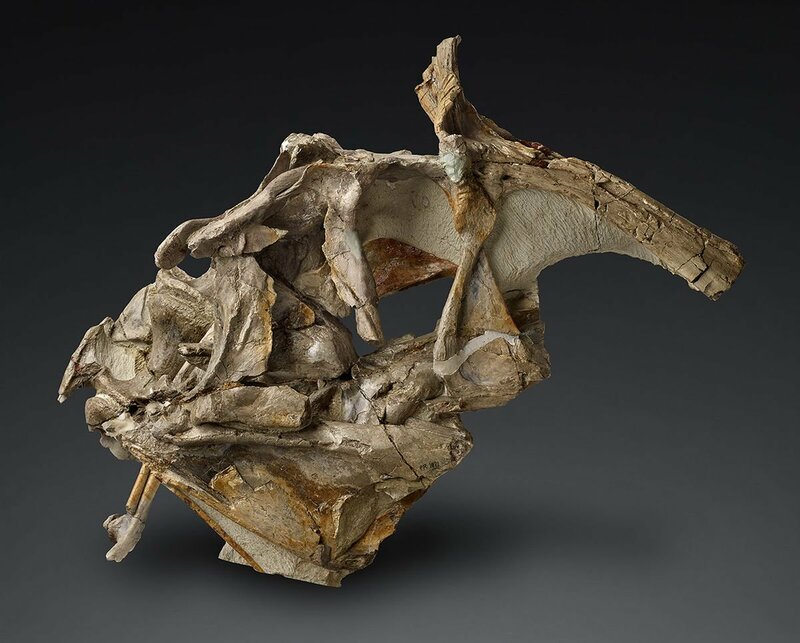 These two tiny long-necked dinos are yet-to-be-named, hence the designation of A and B, but are built out in life-sized models to show what they would have looked like – essentially like Apatosaurs, but the size of a large dog. Along with other fossils here and there, and an impressive collection of cold weather excavation gear both modern and historic, this exhibit gives a snapshot of what exploration and palaeontology are like in the coldest place on Earth. The skeleton of Cryolophosaurus on display in the hall measures 25 feet long. The exhibition opens on Wednesday, April 3 and runs through Jan. 5, 2020 at the Natural History Museum of Los Angeles County. For more information and tickets, visit NHM.org. 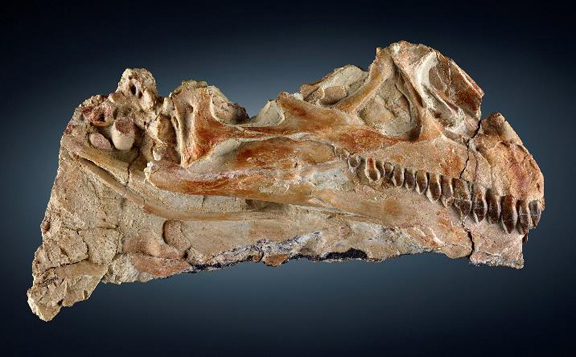 A fossil of the head of a Cryolophosaurus is now on display at the Natural History Museum Los Angeles. A very cool exhibit! I saw it at the Field Museum in Chicago a couple months ago. Thanks for sharing this!